Owing to our speedy distribution network, we are capable to render quickly and hassle free deliveries. Situated in Hyderabad(India), the company has carved a niche for itself in the market with its flawless range of products. We are identified as one of reputed Mobile Scaffold Towers Manufacturers & Suppliers in the country. Our Mobile Scaffold Towers are popular in the market for high strength, rugged construction and durability. We make available the wide range of sturdy Mobile Scaffold Towers at competitive prices. 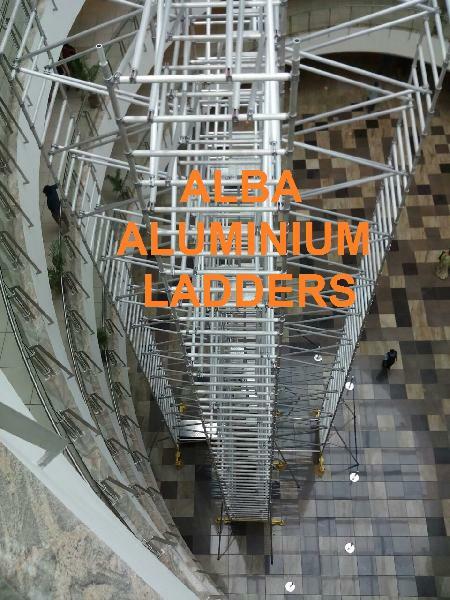 H-Frames : Each H frames of 2 meters Height with spigot made-up of 50 mm dia Aluminium Alloy round pipes are connected with ‘T’ joints fully welded with Aluminium wire. Special TIG welding. For maximum strength and durability. Brasses Horizontal & Diagonal : Self auto locking snap braces spring loaded horizontally and diagonally fully Aluminium welded for maximum strength and durability. Working Platform : Working platform made up of Aluminium Alloy rectangular sections fitted with side claws hook, lifting ring and trapdoor systems. fitted with Aluminium chequered plate (sheet)fully welded. It can placed at any required height. Adjustable Outrigger : Adjustable outrigger (stabilizers) Spring loaded with handle adjustment can be connect to the structure of freestanding scaffolding towers fitted with clamps and rubber bungs. MS Trolley with Jack Castor Wheel’s : Breakable castor wheels heavy duty with a load rating of 900 Kgs. With 12 inches adjustment for an even areas like steps, staircase and sloping rungs. Available Sizes : Free standing 6ft. to 60ft., Supported up to 200ft.